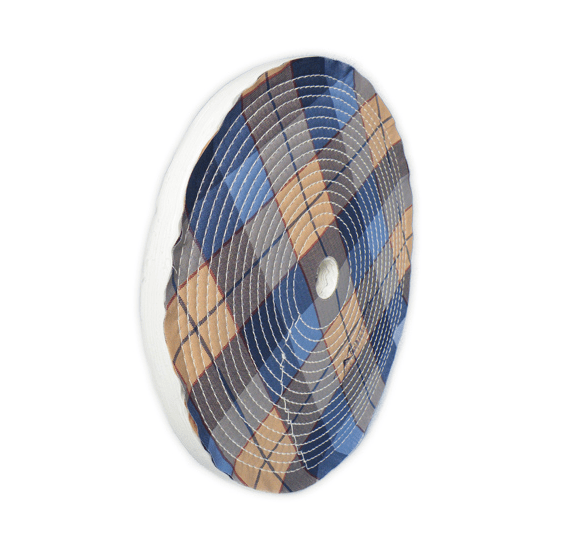 The tightly stitched polishing wheels FAPI-SEAM are assembled from sheets of even sizes. The specific lay is held together by tightly spaced and adjacent stitching seams. The cloth qualities are explained in the table below. Tightly stitched polishing wheels FAPI-SEAM are used for polishing on automated polishing machines and for manual processing on a backstand. With the tightly stitched polishing wheel FAPI-SEAM, the effect of the stitch seams is decisive. Every stitch seam is effectively hard and all of the stitch seams collectively can even cause scoring of the workpiece during polishing. Thus the entire polishing wheel operates harder. This is because, the individual cloth pieces held in place by the tight stitching have no ability to give way. The tightly stitched polishing wheels FAPI-SEAM are especially well suited for pre-polishing, polishing and finishing of flat and lightly deformed workpieces. Because of their hardness, the tightly stitched polishing wheels FAPI-SEAM are also used as grinding wheels for industrial gluing. For gentle cleaning of the running surface and/or for opening when clogged with polishing emulsion/paste, we recommend our polishing disc dresser FAPI-PLANER! As with all polishing wheels made of cloth, the work of the tightly stitched polishing wheels FAPI-SEAM is done by the roughened threads on the wheel’s perimeter. In addition, with tightly stitched polishing wheels FAPI-SEAM, the stitched seams make themselves noticeable, i.e. the polishing wheel performs very aggressively. Thus these polishing wheels are more aggressive than buffing wheels and flap wheels during the polishing process. The danger with tightly stitched polishing wheels FAPI-SEAM when working manually is, that above all when working on smaller workpieces, the cloth pieces knock against the operator’s hand. If polishing is thus not possible, a buffing wheel FAPI-BUFF should be used instead.